There’s a street in Montgomery that locals say is one of the most historic in America. A large fountain sits at the western end, the site of the city’s once-booming slave market. At the eastern end is the Alabama State Capitol, where Jefferson Davis was sworn in as president of the Confederacy. In between is Dexter Avenue King Memorial Baptist Church, where Dr. Martin Luther King Jr. served as pastor in the late 1950s. The street is also home to the spot where Rosa Parks boarded the bus on which she refused to give up her seat to a white passenger. That roughly half-mile street, Dexter Avenue, tells the story of Montgomery as both the birthplace of the Confederacy and the city where the modern civil rights movement took off. 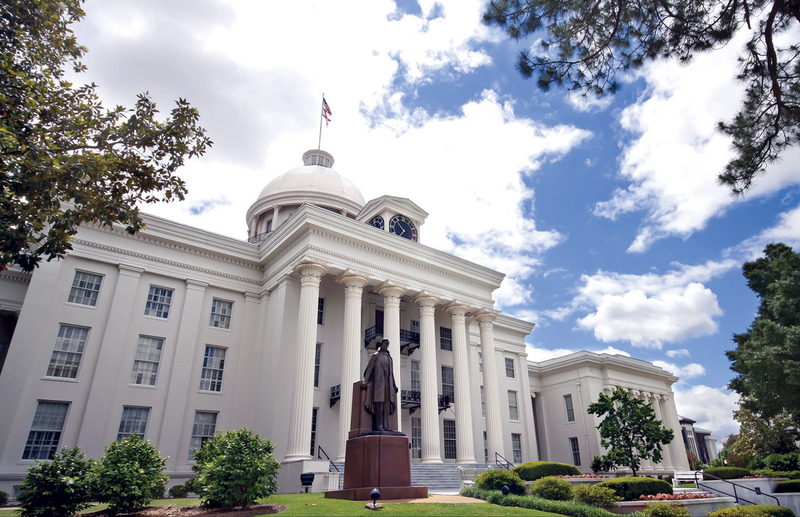 The history here is complicated, crowded, and occasionally competing, and it’s on full display this year as Alabama gears up for its bicentennial celebration. Alabama became a state on December 14, 1819; Montgomery was founded the same year along the banks of the Alabama River. Set on a small hilltop overlooking Montgomery, the memorial contains more than 800 weathered steel slabs. Each represents a county where a lynching has taken place and includes the name or names, when known, of those killed. The slabs are hung from the roof, but the floor is sloped, making them appear at eye level at the start of the memorial and rise above people’s heads toward the end. Along the way, visitors may read purported justifications for the killings: “For voting.” “For asking a white woman for a drink of water.” “For organizing local sharecroppers.” The six-acre site is a powerful reminder of the past, but it also serves as a call to action. An identical set of steel slabs rests on the ground nearby; they are meant to be claimed and installed by the counties they represent. So far, none have moved. 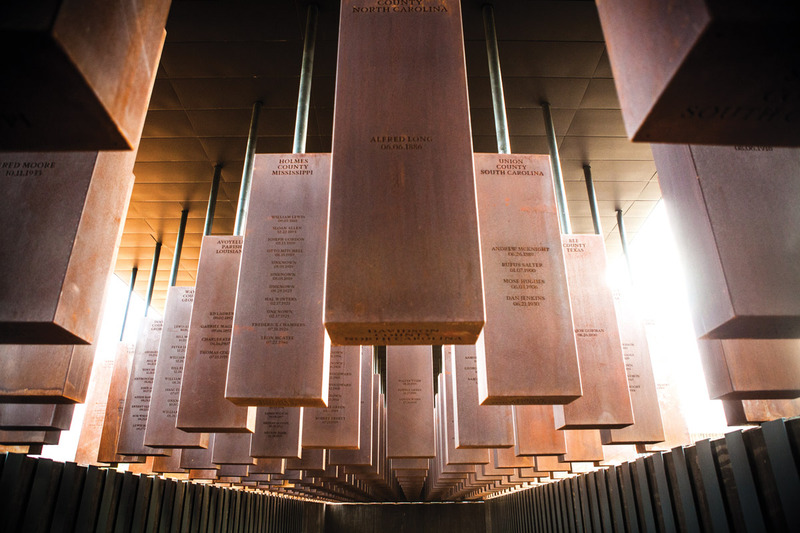 But the Equal Justice Initiative, the organization behind the memorial, is in talks with dozens of communities interested in erecting their monuments. The provocative memorial opened at the same time as downtown’s Legacy Museum, which sits on the site of a former slave warehouse. 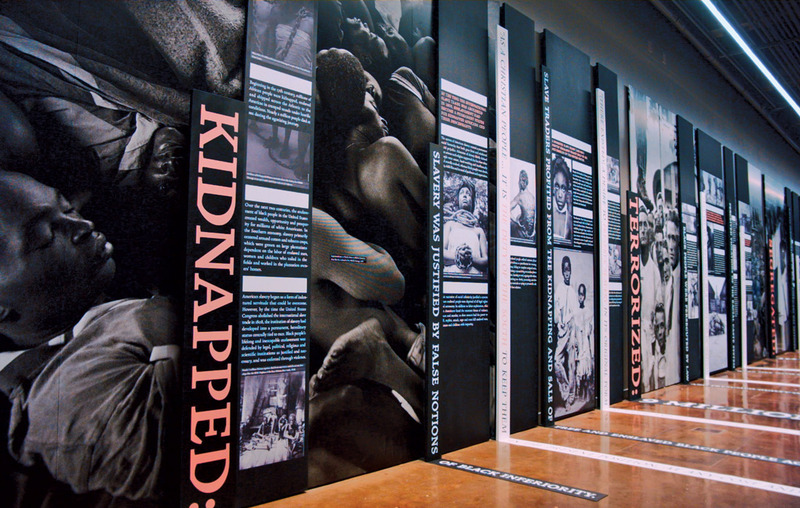 The 11,000-square-foot museum helps put the memorial into context, tracing the history of racial inequality from slavery and segregation to present-day mass incarceration. While downtown, don’t miss several other spots significant to Montgomery’s history. 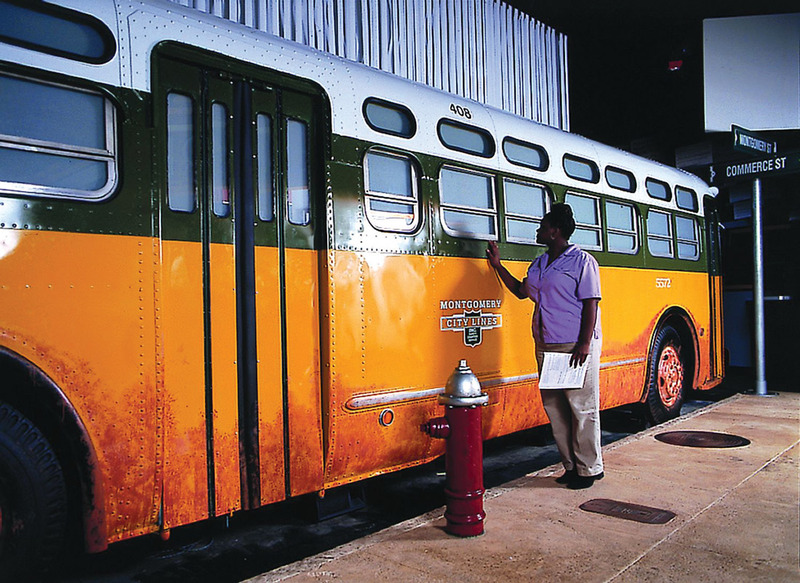 The Rosa Parks Museum puts visitors directly outside a replica of her bus to watch a reenactment of her arrest. By design, the room is dark and cold, much like the evening of December 1, 1955. It was this event that led to the Montgomery Bus Boycott, the success of which electrified the civil rights movement and catapulted a young King into the national spotlight. 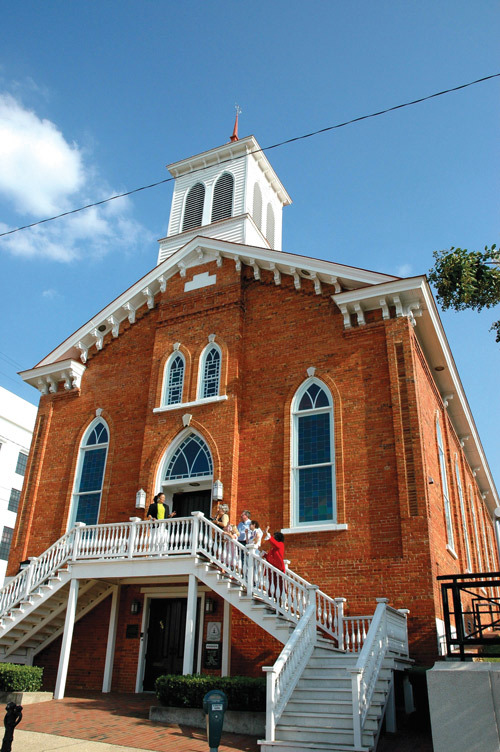 See where MLK preached at Dexter Avenue King Memorial Baptist Church, which offers tours of his office and the sanctuary. If you go on a Sunday, note that the organist King hired still plays services. From there, visit the Dexter Parsonage Museum, the simple clapboard house where King lived with his family. For a look inside another historic home, this one from the Civil War era, head to the First White House of the Confederacy, once the residence of Jefferson Davis and his family. Tour his bedroom and see a variety of keepsakes, such as his pipe, a lock of his hair, and flowers from his grave. Nearby is the Alabama State Capitol. It’s here that Southern delegates met to organize the Confederate States of America and swore in Davis as their president in 1861. The Senate room is restored to look like it did that year, complete with replica desks and light fixtures. A monument to Davis sits outside the capitol building not far from where King stood to deliver his famous “How Long, Not Long” speech at the end of the historic Selma to Montgomery march in 1965. So fiercely does Montgomery love its food, it named its Minor League Baseball team the Montgomery Biscuits. (The team’s mascot? A biscuit-eating beast named Big Mo.) Begin your culinary tour of the capital at Cahawba House, a cozy breakfast and lunch spot known for—you guessed it—biscuits. The restaurant also makes a pretty mean cinnamon beignet. If you prefer a quick in-and-out lunch, try Derk’s Filet and Vine, a restaurant and market in one. Make a plate at the hot bar, which is always stocked with Southern favorites, such as pulled pork, fried chicken, and vegetables cooked into submission. The jalapeño cornbread is perfection. Wash it all down with some sweet tea, and pick up a six-pack of Imperial Stout from Alabama’s Blue Pants Brewery to go. Speaking of beer, Montgomery recently welcomed its first production brewery: Common Bond. Its industrial downtown taproom doesn’t serve food—just good beer, including crowd-friendly American ales—but you can call Bibb Street Pizza next door and have a pie delivered. For a more upscale experience, try Central. The restaurant, set in an 1890s warehouse space, is Montgomery’s go-to place for creative cocktails and well-made classics. Order the fett sow fries to start. 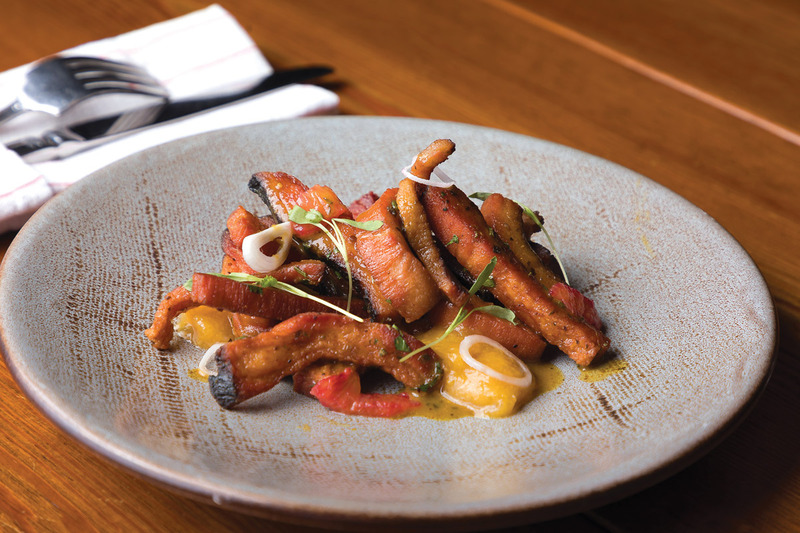 (They look like fries, but they’re pork belly.) Mains are made in the open kitchen using fresh and local ingredients. To pick up some of those basics, head to Montgomery Curb Market, which offers everything from flowers and produce to homemade soups and pies several mornings a week. Not ready for the day to end? Top it off with a nightcap at the downtown Aviator Bar, so named for its over-the-top airplane kitsch and wartime memorabilia.